By defeating the Memphis Grizzlies on April 13, 2016, the Golden State Warriors won their 73rd game this season, setting the record for the most games won during the NBA regular season. The Warriors finish the 2015-16 NBA regular season with a 73-9 record. One Oakland restaurant is offering the celebratory, albeit boozy, deal of a lifetime in honor of the Golden State Warriors, who made basketball history Wednesday night with the most wins in a season. Lake Chalet restaurant on Lakeside Drive will serve handcrafted ales for 73 cents all day long. 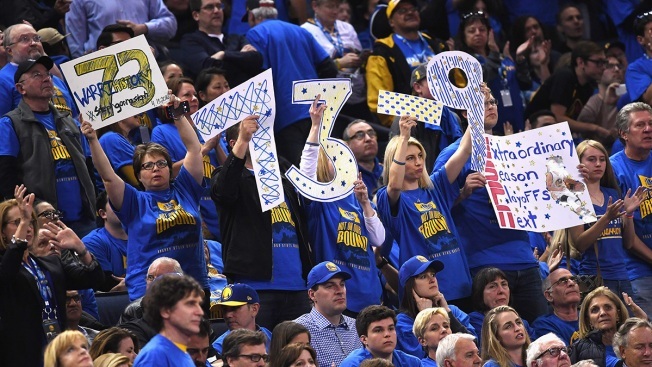 Yes, if you haven't clued in, the Warriors beat the Memphis Grizzlies at the Oracle Arena, giving them the historical honor of winning 73 games in a single NBA season. The team who last did that was the Chicago Bulls in 1995, when they won 72. The restaurant has a few caveats though: The offer is limited while supply lasts. And the management (as always) has the discretion of kicking unruly customers out.